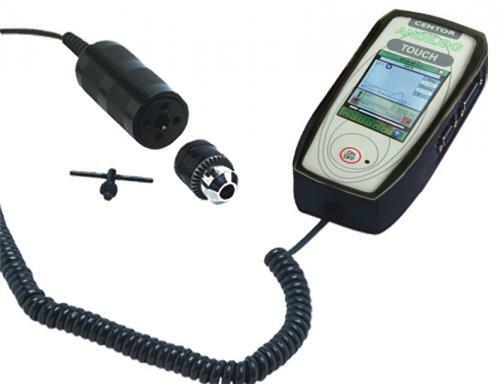 The Centor Touch Star TH is a static torque gauge with an handle torque sensor. Dedicated to fit a large range of in-line torque measurement applications, the Touch Star TH Torque gauge from ANDILOG is designed with the latest advanced technologies. Supplied with a chuck grips, it can be used to hold round, hex or triangular specimens. Besides having all the features of the Centor Easy, the Centor Touch Star TH torque gauge with handle sensor provides handy further possibilities: the graphic display shows the full graph Torque = C(t) giving you a general overview of the current test. The Centor Touch torque Gauge is equipped with our sensor recognition feature: with a single instrument read different sensors (several capacities, Force or Torque sensors). Also the handheld torque gauge is able to make several types of calculations on demand (break point, first peak, average, torque at time value, etc.). This torque gauge is simple, inherently precise, and offer advanced features. Furthermore, it is possible to freeze its configuration to avoid handling errors. Apply torque with a slow, smooth, and uniformed turn at the torque sensor handle. Typical applications: Screwing&unscrewing, Tightens fasteners, in-line non-rotating parts torque measurement, Medical implants torque testing, Static torque measurements on a large range of samples test by hand. Torque screwdriver is used anywhere you need precision in assembly or maintenance. The digital torque gauge Centor W Easy TH is mounted with a handle sensor and has a very large graphic display to show a maximum amount of information for more efficient measuring. It is an ideal force tester to torque measurement on the field in production, quality, or research.